Reverse bay parking should be an essential component of any learner driver’s education, as it is a useful skill for every road user to have. The easiest way to perform the manoeuvre is to enter the bay from an angle of 90 degrees, though some drivers favour coming in from a diagonal. But why do we do it? Surely it’s easier to drive directly into the bay on a straight line? Probably, but the problem comes later, when you have to reverse back out, without damaging your own car, or those parking in the adjacent bays. This holds particularly true if the back seat is filled with passengers, or if your view out of the rear window is otherwise impaired. Reversing into a bay is not a race, so feel free to take it easy. Keep your car’s speed to the level of a sedate walking pace. Not only will it make any adjustments easier, it means you will be able to spot pedestrians crossing the path of your vehicle, whether behind or in front. Choose whichever parking bay you would like to reverse into. Make sure that there is adequate space for you and your passengers to open your car doors. Pull to a stop around two car lengths beyond the vacant bay, and put the car into reverse gear. The cornerstone of any driving manoeuvre, take time out to have a good look in all directions, including your mirrors, and ensure that you are safe to begin your parking. Start reversing slowly, backing up until the initial white line in that marks the parking bay is lined up with the edge of your rear seat. Be sure to check your position regularly, by utilising the window on the passenger side door. You should have the steering wheel turned to a full lock to the right (in reversing into a right-hand bay) or the left (if reversing into a left-hand bay). Keep the lock on as you start reversing your vehicle smoothly and slowly into your chosen parking bay. As your car starts to become straight, you’ll want to bring it parallel to the parking bay’s white lines. As you reverse, start straightening your steering appropriately, until you end up centred in the parking bay. 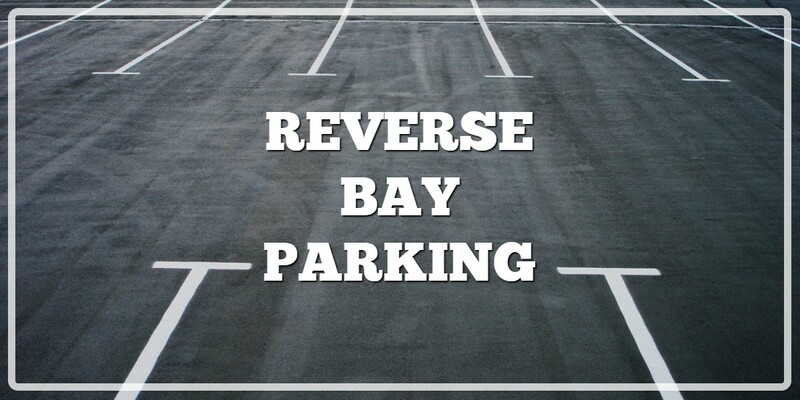 Reverse bay parking is a key manoeuvre on your driving test. If you’re a learner driver in the Essex area, contact Alfie’s Driving School and we will set you on the right road to success.